To begin with, like most Arsenal fans right now, I was quite satisfied with Arsene Wenger keeping the same starting eleven as our last match against Burnley. It was nice to see that Wenger recognised that the team did not need too be chopped and changed around an awful lot. Another positive from the team selection yesterday was seeing Lucas back on the bench after recovering from his knee injury just prior to the International break. When the game kicked off, I expected Arsenal to press Swansea high up the field from the get go, just like the recent home matches against Chelsea and Basel. I was also intrigued to see if Alex Iwobi and Theo Walcott would keep up their recent impressive form, with them both seeing a lot of the ball early alongside Mesut Ozil, Alexis and Santi Cazorla. Arsenal looked the most likely to break the deadlock in the first half. However, like most teams in the premier league today, Swansea had some quality on the field and had the first major attempt to shout about, when a rather impressive Barrow pulled the ball back to Fer who curled his shot just over the bar. Arsenal then had plenty of possession, but began to look some what more decisive with the ball in the final third. Then, after 26 minutes, Alexis chipped a pass in behind the Swansea Defence towards Bellerin, who headed to ball into the penalty area, but straight at Swansea Defender Amat. A major lapse in concentration from Amat though, set the ball up nicely for Theo Walcott in the six yard box for him to open the scoring for Arsenal. This goal really emulating the hard work that Theo Walcott has added to his game this season. Shortly after, a corner was taken by Arsenal just in front of the Swansea faithful, which travelled over everyone’s head and flicked up off Sigurdsson’s ankle and set up nicely for Theo Walcott to control, swivel and rifle straight down the middle past Fabianski into the net. With Arsenal now in full control and Swansea’s confidence low, Xhaka then presented them with a glimmer of hope just before half time, when his miss-control on the edge of Arsenal’s penalty area, left Sigurdsson only needing to side foot the ball round Petr Cech and into the Arsenal goal. Arsenal still, however, went in a half time 2-1 up and fully deserving to be in the lead. Both teams came out for the second half, and the tempo of the game stayed relatively similar. Arsenal looked comfortable on the ball and Swansea looked slightly insecure at the back. Then, ten minutes into the second half, Alexis picked up the ball just outside the penalty area and put a pin point cross to Ozil who caught a first time volley beautifully which rocketed into the roof of the net, leaving Fabianski no chance in the Swansea goal. Continuing his good performance, Barrow beat Monreal down the right hand side and held the ball up well whist also picking out a nice pass to find Baston in the middle of the Arsenal penalty area to slot home past Petr Cech while Arsenal defence stood rooted to the spot watching the ball, not the man.. With Swansea back in the game and gaining confidence, the momentum shifted completely to Swansea. Five minutes later, Granit Xhaka cynically fouled Barrow from behind on the half way line and received a red card for his troubles. Apparently new rules brought in this season ex[plains why Moss sent the Arsenal player off. Swansea then went on to make chances with their player advantage, yet failed to take any of them. The best of Swansea’s chances falling to Sigurdsson who blazed the ball over the crossbar from about five yards out after another Barrow cross into the box. Arsenal, and in particular Walcott, went on to have the best of the late chances as twice Walcott was set up by Chamberlain, in which both times the woodwork denied him getting his well deserved Hat-Trick on the day. This win then took Arsenals winning streak to six games and joint top of the Premier League after Tottenham and Manchester City both dropped points In their games against West Brom and Everton respectively. After a very good end to 2014 Arsenal travelled to Southampton. Two mistakes from Szczesny handed Saints a 2-0 win and the result could not really be argued. The first Szczesny came out and was lobbed and the second managed to toe poke the ball straight to Tadic who gratefully accepted the chance. One really good chance for Cazorla, a few half chances for Chamberlain and Alexis were all Arsenal mustered. Coquelin started his second full match for Arsenal since being called back from a loan spell with Charlton due to an injury picked up by Ramsey in December. What a difference this guy was about to make to the second half of the season. The draw for the FA Cup 3rd round brought up a repeat of last season’s final with Hull City travelling to the Emirates. Hull had already visited the Emirates in the league and came away with a credible 2-2 draw. Theo Walcott made his first appearance for a year and only two of the team that beat Hull in the Cup last May started this match. Arsenal won the game deservedly 2-0 a Mertesacker header from a corner and a tidy turn and finish from Alexis. Next up were our friends from Middle Earth. Ospina kept his place in-goal. Arsenal won with ease. Goals from Koscielny and two from Alexis saw Arsenal run out 3-0 winners. Once again though 3-0 up and the scoring stopped. Debuchy came back in for Chambers, picked up an injured shoulder and would be out for a while. Arsenal travelled to Manchester City with the old “Arsenal don’t do well against the big teams” ringing in their ears. Well this was a different Arsenal performance, more focused on defence as a team and how our opponents play. City threatened in the first half but Ospina did not have a save to make. Arsenal soaked up whatever City threw, minus Yaya and scored twice themselves with a Cazorla penalty and a Giroud header from a Cazorla free kick.. This was a superb win that showed Arsenal could beat the big sides if they set up correctly. FA Cup fourth round was up next. An away visit to Brighton where Arsenal had beat them 3-2 only two seasons before in the Cup. This time goals from Walcott. Ozil and a cracker from Rosicky helped produce another 3-2 victory and move Arsenal into the fifth round. On 26 January Arsenal signed Gabriel Paulista from Villareal for around £11m which looked a good addition for cover on The BFG and Koscielny. After a poor start to the month away at Southampton. Arsenal recorded four wins on the spin, finished the month with thirty-nine points from twenty-two games and fifth in the table. January picked up after the defeat away at Southampton and the victory at Manchester City would give the team confidence to push on for the rest of the season. 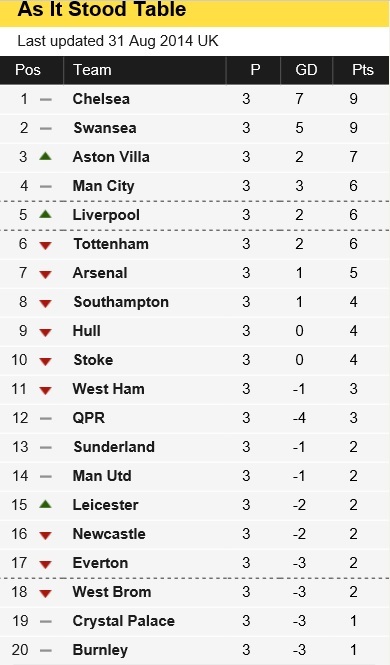 Arsenal started the month turning over Aston Villa 5-0 at home and this without Alexis. The flick of the season from Ozil set up Giroud to start the rout. Three passes from Edge of Arsenal’s box saw Ozil make it 2-0. Four passes from back to front then saw Walcott curl in Arsenal’s third. A penalty from Cazorla and a nice placed finish from Bellerin ended the scoring. Arsenal had kept three clean sheets and taken nineteen out of a possible twenty-four points. Next up was the North London derby at Shite Hart Lane. Arsene Wenger’s 700th Premiership match and 45th North London Derby. Arsenal started well and went 1-0 early on through a well taken goal by Ozil set up by Welbeck and Giroud (miss-kick?) . Then Arsenal sat back and Spurs poured forward. Spurs players were certainly getting stuck in and maybe Rose and Mason may well have seen red on another day with Atkinson in another of his poor game modes. With Arsenal having held out till half time you could sense a Spurs goal was coming and Kane came up with the goods for Spurs on fifty-six minutes to equalise. Arsenal could not get their game going at all and yet Koscielny could have put Arsenal ahead with a header he put straight at Lloris. With four minutes left Kane rose to head home to give Spurs a 2-1 win. North London was white 🙂 The shift in North London was being mentioned again. Spurs were going to finish above Arsenal. Spurs were nailed on for top four. Those living in the shadows of North London will never learn. Leicester City were Arsenal’s next opponents at the Emirates. Sanchez was back to replace Giroud. Walcott and Rosicky replaced Welbeck and Ramsey. Arsenal won with goals from Koscielny and Walcott both assisted by Ozil. Leicester did well and had their chances and pulled one back in the sixty-first minute. Only a good save by Ospina stopped Leicester maybe getting a well deserved draw. FA Cup firth Round day and Middlesboro were the visitors. Gabriel made his debut for the club. Szczesny back in for Ospina. Cazorla was made Captain. Riding high in the Championship and having defeated Manchester City 2-0 at the £tihad in the previous round, this was billed as a very close match. It never turned out that way a two goals in two minutes from Giroud in the first half settled the match. The first a simply majestic team goal where every player in the Arsenal side touched the ball before Giroud scored. Arsenal dominated and there were to be no heroics from Boro in this game. in truth if it were not for Mejias in-goal for Boro, the scoreline could have been 5-0. Arsenal travelled over the Thames to Crystal Palace in what looked like a tough match as Pardew had got Palace playing some decent football and winning matches. Jack Wilshere out for three months returned to the squad. Arsenal went 2-0 up through a Cazorla penalty and a well worked goal leading to Giroud scoring and taking his tally for Arsenal to fifty goals. the last fifteen minutes Palace piled on the pressure, got one back and then hit the post, but Arsenal somehow held on and took the three points as Palace though with plenty of pressure and twenty odd shots a goal only three were on target. The final game of the month was at home in the Champions League against Monaco. What looked like a good draw for Arsenal ended up being a nightmare evening as Arsenal played poorly or maybe were made to play poorly as Monaco won 3-1 and totally deserved their victory. Monaco were also shorn of a few of the main players. Only highlight for Arsenal was a late cracker from Oxlade-Chamberlain that might have given Arsenal a small chance in the second leg. 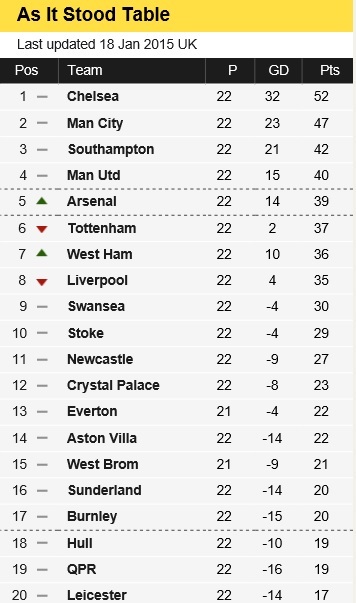 Arsenal finished the month with Forty-Eight points from twenty-six games and third in the table. Arsenal won three of their four league games and progressed to the sixth round of the FA Cup. The table also showed Arsenal five points clear of Tottenham who only two league games earlier were one point clear of Arsenal and the pride of North London. Gabriel got his first Premier League start at home to Everton. Arsenal’s first goal saw Giroud score from a Ozil corner. A great chance fell to Ozil but a very good tackle from Jagielka saved Everton. A late Tomas Rosicky shot from outside the box that took a slight deflection sealed the result for Arsenal 2-0. Hardly a classic performance but three welcome points. Arsenal then travelled the short distance to West London to take on Queen’s Park Raisins. A largely uninspiring first half came to life in the second with Arsenal playing some good football. This was rewarded with two goals in five minutes with Giroud stabbing home from Gibbs short cross. Alexis made it 2-0 with one of his weaving runs and near post shot. Austin pulled one back for Rangers. The truth is Arsenal should have won by a bigger margin here. However a fourth consecutive league win was welcome. BBC Sports decided Arsenal’s away match against Manchester United in the FA Cup sixth round would be played at 8pm on a Monday evening. Manchester United had reached the sixth round beating Yeovil, Cambridge and Preston. Arsenal actually played well and went 1-0 up after twenty-five minutes through a well worked team goal finished by Monreal. Sadly Arsenal only held out four minutes as their nemesis Rooney scored for United to equalise. Valencia then assisted Arsenal in the sixty-first minute with a short back pass that Welbeck anticipated, rounded (shoot straight me) de Gea and slide the ball home for 2-1 Arsenal. Cazorla then shot straight at de Gea, though to be fair it was a good save that should have been 3-1. Signing of the season, Di Maria, all £63m of him got himself sent off . A fully deserved victory for Arsenal as they went through into the semi-finals of the FA Cup. West Ham then popped over from East London to the Emirates and if you want to talk quick passing and a superb goal at the end of a speedy move, look no further than Arsenal’s first goal in this match right on half time. A cracker into the top corner from Giroud, who simply cannot stop scoring right now. Arsenal should have been at least 3-0 up at half time but wasted chances. Arsenal’s second came on eighty-four minutes from a thrown-in which saw Giroud and Ramsey have an exchange of passes before Ramsey slide the home. Another superb move only a couple of minutes ended with Cazorla sliding the ball across the area for Flamini to tap in with his first touch of the ball. 3-0 to Arsenal. After a run of domestic games it was back to the Champions League and the second leg away against Monaco. Arsenal needed to win by three clear goals to progress into the next round. Maybe even a 3-1 victory and win on penalties, but whatever this was going to be a tough ask. In the end a first half strike from Giroud and late goal from Ramsey just wasn’t enough. Arsenal teased as usual winning 2-0 on the night and going out on the away goal rule, yet again. It was back to the Premier League and a trip up north to play Newcastle United who were not exactly setting the world on fire. Arsenal didn’t really play that well, but two first half goals from Giroud put Arsenal 2-0 up at the break. A quick reply from Newcastle in the second half reduced the arrears and Arsenal held on. Newcastle had plenty of the ball yet only one really good chance to equalize, however, Ospina was up to the task saving from Sissoko. 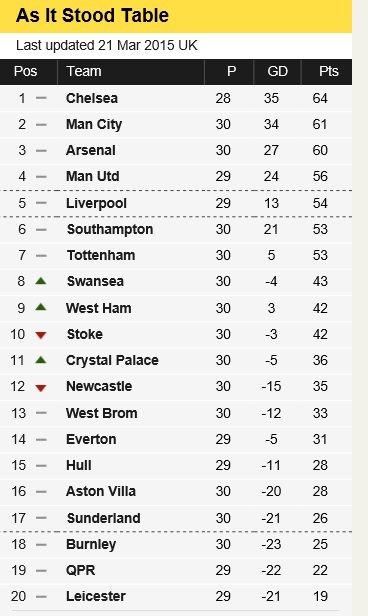 Arsenal finished the month with sixty points from thirty games and third in the table. Arsenal won four out of four league games, beat Monaco 2-0 away in Champions League and progressed to the sixth round of the FA Cup. Six-out-of-six wins in the month. Four defeats in twenty-games since the beginning of December the team were certainly getting it together and playing taking each opposition into account. Downer was going out yet again at the knock out stage of the Champions League. Arsenal started the month with a superb victory over Liverpool winning 4-1 at home and continuing their recent revival of form. Three first half goals in eight minutes put Arsenal 3-0 up at the break with a superb solo run and curled shot from Bellerin. A lovely free-kick from Ozil and a hammer shot from Sanchez. Liverpool pulled one back through a Henderson penalty, however, Giroud scored another beauty on ninety minutes to give the scoreline a better look to it after Can had been sent off for Liverpool. Arsenal then travelled up to the North West to take on relegation candidates Burnley. An Aaron Ramsey goal on twelve minutes settled the game after about four chances in the Burnley area went begging. Arsenal once again should have put this game to bed and though Burnley battled well, but Arsenal should have won by more. FA Cup Semi-Final day. The draw had seen Arsenal pitched against Reading who were languishing down the bottom end of the Championship. Previous matches Arsenal had played at Wembley showed that nothing is guaranteed. Arsenal took the lead through Alexis who was on the end of a superb ball from Ozil, to control and tucked the ball nicely past the keeper. Reading battled and got a reward after sixty-one minutes when McCleary scored to equalise. The game went to extra-tine and in the one-hundredth and sixth minute Alexis won the match as the his low shot squirmed under the keeper to make it 2-1 to Arsenal who moved into their second successive FA Cup final. Chelsea came to the Emirates for a match Arsenal simply had to win if they had any chance, however, small of winning the title. Jose played this tight, no forwards and defence all the way. The result was a not surprising 0-0 draw as Arsenal could not break down Chelsea’s defence, producing only one shot on target in the whole game. A professional result that pleased Jose and put to bed any hope of Arsenal winning the title. Arsenal finished the month with sixty-seven points from thirty-three games and still third in the table. Arsenal won two out of three league games and progressed to the FA Cup Final. Arsenal now had only four defeats in twenty-four games since the beginning of December. 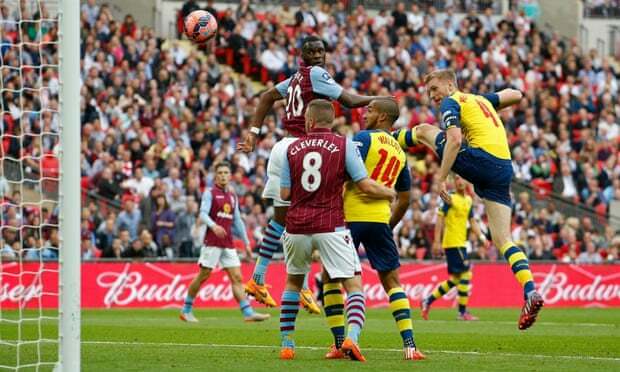 The FA Cup Final would be between Arsenal and Aston Villa who had beaten Liverpool in their semi-final. The month started with Arsenal travelling to Hull City on a Monday night. A superb first half performance from Arsenal saw three quick goals put Arsenal 3-0 up by the break. Two goals from Alexis, one a free kick and the other nicely take rounding the keeper and one from Ramsey whose shot took a deflection off a defender. Arsenal then applied the hand brake again. Hull got one back through Quinn but Arsenal saw the game out to go level on points with Manchester City in second and with a game-in-hand. Seven days later and another Monday night match this time at home to Swansea. Arsenal played some good stuff, had plenty of chances on a night when ex-keeper Fabianski decided to play like a word beater and Swansea defended like Trojans. A late Gomis header sealed the points for Swansea on a disappointing night for Arsenal’s hopes of finishing second. Arsenal went back to Old Trafford to play Manchester United. A win or avoid defeat meant Arsenal could secure or almost secure third place and no pre-qualification for the Champions League proper for next season. Manchester United did not have nemesis Rooney in their line up. Arsenal didn’t really turn up for the first half and United went in at the break 1-o up through Herrera. Arsenal played better in the second half and a cross from Walcott was turned into his own net by Blackett for Arsenal’s equaliser. 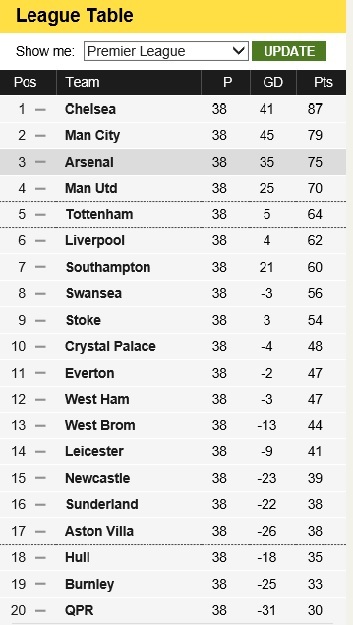 That’s how the game ended and Arsenal only need not lose to Sunderland to be sure of securing that third place finish. Sunderland came to the Emirates fighting to stay in the premiership. Arsenal had plenty of the game, created enough chances to have won two games and yet somehow with some good defending Sunderland got the point they needed with a 0-0 draw. Another disappointing performance from Arsenal having now gone three homes games without scoring a goal. The final league match was at home to West Bromwich Albion and Arsenal took them apart in the first half with four well taken goals and one of them Wilshere’s winning the MOTD goals of the season award. The second half was mainly just going through the motions and that hand break was applied to good use as it was so many times over the. season. However with the game won here and an FA Cup Final only a few days away, it was sort of understandable. 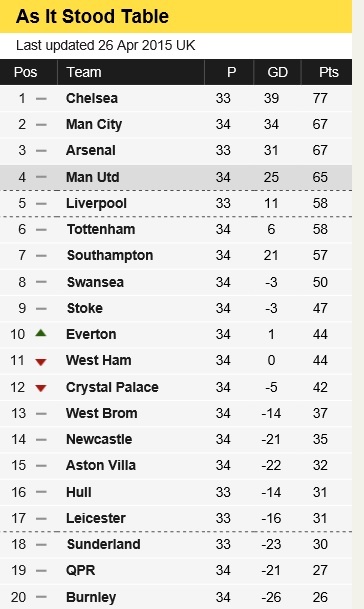 Arsenal finished on seventy-five points from thirty-eight games and in third place. Five defeats in the last thirty games. Finishing a full eleven points ahead of the mob down the Seven Sisters Road. The final game of the season was the FA Cup Final at Wembley against Aston Villa. 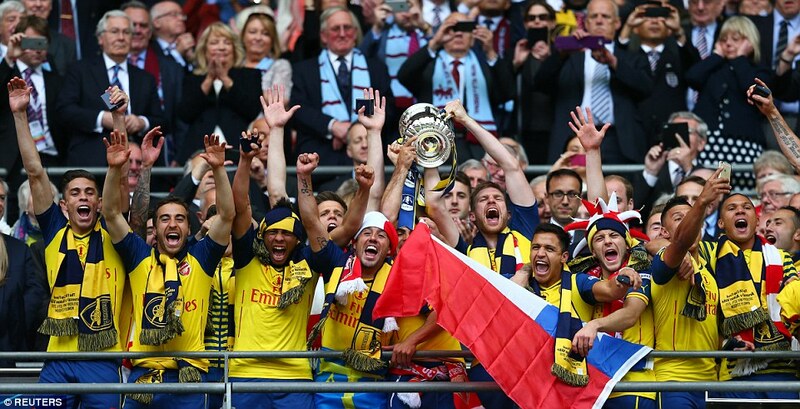 A comprehensive 4-0 win saw Arsenal take their second successive FA Cup trophy. Albeit the match was one-sided as Arsenal not only stopped Villa playing, but played as well as they have all season, thus ending the season on a high note. Third in the table and a trophy to boot is a slight improvement on last season. Fewer points gained than previous season, but that may say more about the Premiership overall last season, only this time with third place there will be no Champions League qualifiers to get in the way early next season. Enough enjoyable games from December onwards, start could have been so much better. Next up was the Emirates Cup where Arsenal beat Benfica 5-1 with Sanogo scoring four goals. Callum Chambers made his first appearance and Alexis Sanchez made his first start. The following day Arsenal was robbed of the draw in the match v Monaco with the worse penalty decision not given I’ve seen. Akpom was well inside the area and Atkinson took the word of his linesman and gave a free kick outside the area. This was followed by Arsenal’s third visit to Wembley in the space of three months, where Arsenal ran out easy 3-0 victors over Manchester City. Sanchez, Chambers and Debuchy all got run outs. The league started with a 2-1 win over Crystal Palace with Alexis Sanchez, Manuel Debuchy and Callum Chambers all making their full debuts for the club. This game was much harder than it looked, Palace took the lead and Arsenal equalised right on HT with Koscielny converting a Sanchez cross. Late in the game Puncheon got sent off and almost immediately Ramsey scored the winner right on full-time. I then took flight to Antalya in Turkey for holidays and followed the Besiktas match on Twitter and a lucky escape for Arsenal as Besiktas played well, so a 0-0 draw was good. Everton could have been away with the fairies by half time. However, Arsenal were much better in the second half and goals from Ramsey/Giroud gave Arsenal 2-2 draw and a deserved point. Besiktas at home was also close, however a goal right on half time by Sanchez proved to be the winner and send Arsenal into the Champions League proper. A League game at Over land and sea (and Leicester) was up next. Once again it was Sanchez who grabbed the goal to give Arsenal a draw against a spirited Leicester side. Giroud was ruled out till January with a broken leg after a late injury picked up in the 2-2 draw away at Everton. 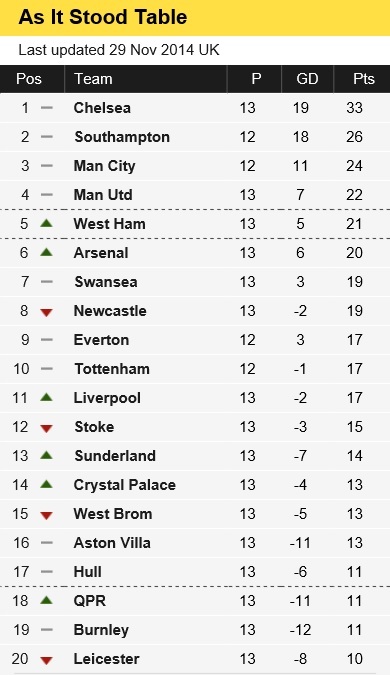 Arsenal finished the month with five points from three games and seventh in the table. Not the start many fans would have expected. A deadline day signing saw Arsene sign Danny Welbeck from Manchester United. This month saw Arsenal win just one match out of five in all competitions. It started with a 2-2 home draw against Manchester City where Augero gave City the lead after a sucker punch break. Wilshere got Arsenal back in it and then Sanchez scored a beauty to put Arsenal ahead. Arsenal fell to not defending a cross when Demichelis headed in with six minutes to go. Arsenal’s first Champions League group match was away at Dortmund and resulted in a 2-0 defeat. Arsenal were just not at the races, even though possession wise they had more of the ball. The reality is possession does not mean goals and with less possession it would not have been unjust if Dortmund had scored five. In the league the next match was away at Aston Villa who had started well and sitting in second place behind Chelsea in the table. Arsenal played well for three minutes and scored in the 33rd, 34th and 35th minutes to win 3-0 with goals from Ozil, Welbeck and an OG by Cissokho. A game where neither side had a shot at goal after the 53rd minute. The Capital One Cup saw Southampton who were also having a good start to the season come to the Emirates. David Ospina made his debut for the club. Arsenal started well and Sanchez scored a cracker from a free-kick to put Arsenal ahead. However, goals from Tadic and a cracker from Clyne gave Saints a 2-1 win and saw Arsenal depart the competition early. The month ended with the North London Derby, Tottenham at the Emirates. Arsene left out Sanchez and Cazorla from the starting line up.. Spurs went 1-0 up through Chadli, though Oxlade-Chamberlain scored the equaliser after seventy-five minutes. Disappointing not to have beaten Spurs having had control of the game for long periods. 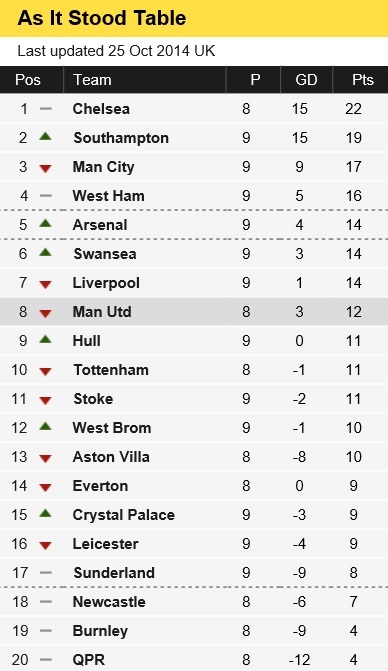 Arsenal finished the month with ten points from six games and in fourth place. The month started with a good win at home to Galatasaray in our second Champions League group match. Arsenal running out 4-1 winners. Goals from Sanchez and a Danny Welbeck hat-trick put Arsenal 4-0 up and from then on it was hand brake on. The first league match of the month was away at Chelsea where our opponents run out 2-0 winners with goals from Hazard (pen) and Costa. I have no doubt Chelsea should have been down to ten men when Cahill made a very poor tackle on Sanchez. Had Cahill been sent off I also have no doubt Hazard would have gone off and replaced by a defender. Hull City were the first team to visit the Emirates in October and it was Sanchez who put Arsenal in the lead. Hull with typical fighting spirit scored within minutes of the Sanchez goal and then again right after half time to go 2-1 up which was a shock for the home crowd. Arsenal had to wait for a ninety-first minute equalise from Welbeck. There was just enough time for a Gibbs chance of a winner but his effort was saved. Champions League Group stage match three was up next against Anderlecht. A scrappy match where both sides were hardly on top form and the first half was dire. On seventy-one minutes Anderlecht got the goal their play deserved as they came more into the match. . Arsenal looked to be struggling however, on came Podolski. Gibbs scored an equaliser in the eighty-ninth minute and one minute later Podolski slammed home the winner and Arsenal got a victory out of a game they looked like losing. Sunderland away in the league was the months last match and Arsenal ran out 2-0 winners with two goals, one in each half from Sanchez, the second coming right on full-time and was Arsenal’s 1500th in the Premier League. 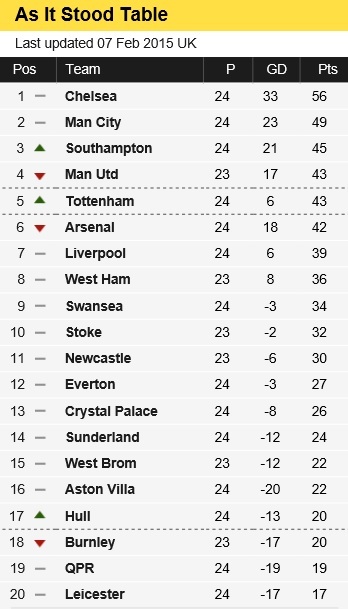 Arsenal ended the month in fifth place on fourteen points from nine games. Burnley were the first visitors to the Emirates in November and Arsenal run out 3-0 winners, pretty much as expected. Arsenal though were made to wait till the seventieth minute for Sanchez to open the scoring. this was followed two minutes later with Chambers getting his first goal for the club. Sanchez rounded off the win in the ninetieth minute. Champions League group match four against Anderlecht was next at the Emirates. A penalty from Arteta put Arsenal 1-0 up after Welbeck was fouled. Sanchez scored a cracker after his original free-kick shot came back of the wall and with fifteen minutes gone in the second half Oxlade-Chamberlain hit a screamer for 3-0 to Arsenal and the game looked dead and buried. However, at 3-0 it was that Arsenal switch off mentality that came into play as if the manager says that’s enough lads, take it easy, play your football and see if the goals come, don’t force the game anymore. In this case Arsenal paid the price and goals from Borre (2) and right on full-time Mitrovic gave Anderlecht a 3-3 draw. Arsenal simply threw the game away. The next league match was away at Swansea. Arsenal went 1-0 up through a superb Arsenal move which ended with Welbeck setting up Sanchez to score from six yards. Make no mistake Arsenal were in control but yet again somehow managed to mess things up and let Swansea back into the game. With fifteen minutes left first Sigurdsson and then three minutes later Gomis put Swansea 2-1 up and this is how the game ended. Once again all very frustrating. Manchester United’s visited the Emirates and how United left with all three points is anyone’s guess. An OG from Gibbs and a second from Arsenal’s nemesis Rooney saw United go 2-0 up. As much as Arsenal pushed forward all they got was a late cracker from Giroud to reduce the arrears. It has to be said United wasted two great chances late on to put the game to bed. Arsenal then beat Dortmund 2-0 at home in their fifth Champions League group match which assured qualification into the last sixteen of the competition. Sanogo opened the scoring for Arsenal with his first competitive goal after only seventy-five seconds. Sanchez scored the deciding goal after fifty-seven minutes to give Arsenal the victory. Arsenal’s next game and final game of the month was away at West Bromwich Albion where Danny Welbeck scored the winner after sixty minutes. 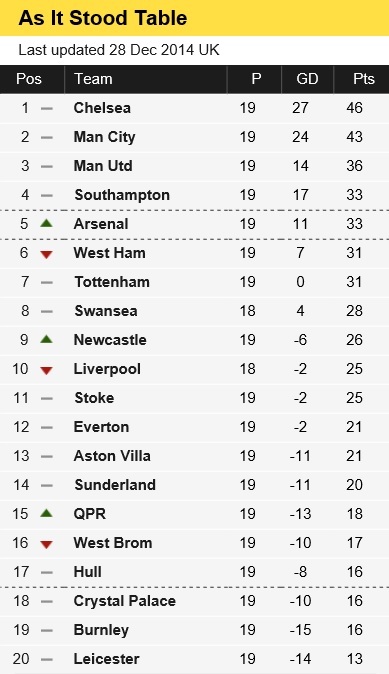 Arsenal ended the month in sixth place on twenty points from fourteen games. 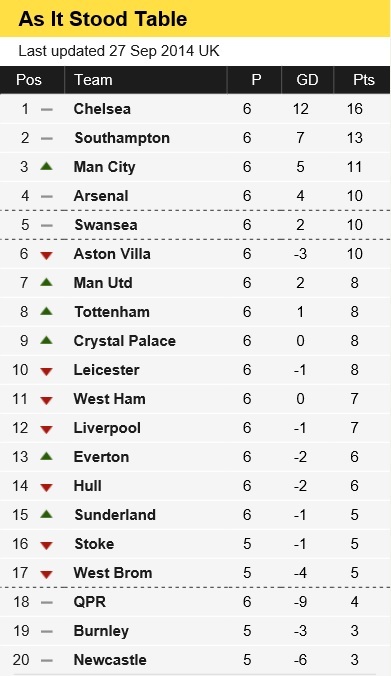 Arsenal started the month with Southampton currently second in the table and playing well. It was also the visitors second visit to the Emirates this season, having won the first. A game where Arsenal played well had enough chances at goal, quite a few on target but had to wait till the last-minute for Sanchez to bag the winner. Next up was the game every Arsenal fan loves – away to Stoke City. No sooner had the game kicked off, when Crouch gave Stoke the lead. Arsenal were shocking in the first half with Stoke scoring two more to go in 3-0 ahead at the break. Arsenal were much better in the second half and pulled back to 3-2 with a penalty from Cazorla and a Ramsey effort. Arsenal looked a comfortable bet at this stage to get something out of the game when Chambers stupidly got himself sent off. I thought the referee seriously helped Stoke here. The game ended 3-2 to Stoke. Champions League again and the last group match away in Turkey v Galatasaray. Would Arsenal take it easy? Well Arsenal were 2-0 up after eleven minutes through Podolski and Ramsey. After nineteen minutes Ramsey surely scored the goal of the season in all competitions with a cracking effort from distance. Gala pulled one back, but Podolski scored his second to give Arsenal a 4-1 win. This left Arsenal on the same points as Dortmund, but the Germans won the group on goal difference. A few days later Arsenal entertained Newcastle and won 4-1 with goals from Giroud (2) and Cazorla (2). Arsenal then travelled to Liverpool the scene of their 5-1 hammering last season. Coutinho put Liverpool 1-0 up yet almost straight away Debuchy grabbed his first goal for the Arsenal. 1-1 at HT. Giroud then put Arsenal 2-1 up and only a late goal by Skrtel stopped Arsenal from bagging a good win. Arsenal’s sixth match of the month saw Queen’s Park Raisins come to the Emirates. Sanchez put Arsenal ahead midway towards the end of the first half. Giroud was then sent off for a headbutt. Rosicky made it 2-0 twenty minutes into the second half and Austin pulled one back for raisins, but ten man Arsenal held on. Arsenal then travelled to East London to play West Ham. Arsenal won 2-1 with late first half goals from Cazorla and Welbeck. West Ham pulled a goal back, but Arsenal should have scored more as chances for Sanchez and Oxlade-Chamberlain went begging. 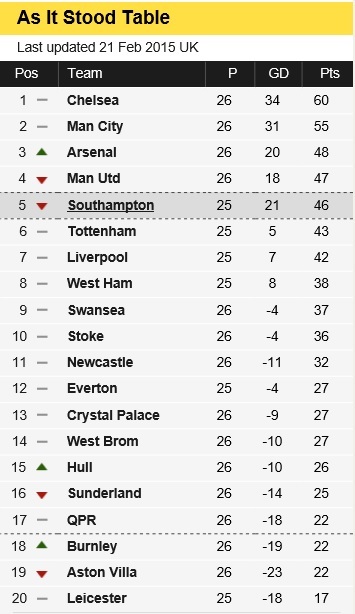 Arsenal ended the month in joint fourth with Southampton on thirty-three points from nineteen games. The first half of the season then was not as good as I would have expected from Arsenal. Going into the New year a full thirteen points behind the leaders Chelsea, eleven points behind second placed Manchester City and somehow Manchester United who were not playing particularly well were also ahead by three points. Injuries once again were played their part. However, the shape of the team was not right and too many players played out of position. The teams tactics against opposition was at times poor and some games were lost and drawn with ease. Opponents were setting themselves up to counter our style of play and finding it all to easy to stifle us. The team did not look like it could gel at all. New signing and worth every penny of his £30m price tag Sanchez saved Arsenal many times from results being even worse than they were. His all round game simply put a smile on supporters faces and he never gave up and full of running and battling qualities as well as the obvious bags of skill he has. Young Bellerin also looked like a good player for the future. Part Two and my awards for the season up soon after the Cup Final.